When Did You Start Being Allowed To Show Your Tattoos At The Olympics? There's been a lot of buzz recently about tattoos in the Olympics and Paralympics – it appears that the International Paralympic Committee are cracking down on certain types of visible tattoos. So, has it always been this strict and when were visible tattoos allowed at the Olympics? The Daily Mail reported that Josef Craig broke advertising rules by not covering his Olympic rings tattoo. Fellow Bustler Rosie Narasaki explained her point of view on Craig's disqualification, "...when you consider the fact that the International Paralympic Committee and the International Olympic Committee are actually separate entities. Thus, sporting one's logo for one of the other's events is actually classified as an advertisement — which subsequently leads to disqualification." Aside from the issue with branding and advertising attire and tattoos that have many rules and regulations – for a sneak peek, see Guidelines Regarding Authorised Identifications – it seems there's not an problem with personal tattoos. According to International Business Times (IBT), "Many famous Olympic medal winners including Michael Phelps, Missy Franklin and Ryan Lochte, sport Olympic tattoos. While having one is fine, any tattoo that advertises a product would need to be covered up." IBT reported that personal tattoos, however, are a different story, "The ruling means that athletes sporting personal tattoos would be allowed, like Russian synchronised swimmer Anastasia Davydova who has a butterfly covered back. She would have no problems in taking part in the Rio Games." Although, it seems the rules are different for Paralympians. IBT explained, "Paralympians, though, would need to cover all their tattoos with the rules being tougher." Which IMO, seems a little unfair to say the least. So when did olympians and paralympians start being allowed to show tattoos at the Games? After much digging, it appears there's not a concrete date when visible tattoos were "allowed" at the Olympics. However, Ringleaders: Olympic Athletes who Donned, Inked, and Embodied the Olympic Logo in the Cold War by Jordan Koch and Douglas Brown, nods towards the forerunners of the inked Olympian movement. Olympic swimmer Graham Smith had a Maple Leaf tattooed on his chest in 1977, to showcase the national pride he felt for Canada, setting a trend amongst his national team members. According to Koch and Brown, "In Smith’s era, an athlete with a tattoo was unusual to say the least. While Smith appears to have been on the cusp of newer social attitudes toward tattoos, in the highly disciplined context of amateur sport in the 1970s, this overt display of body modification must have been interpreted by at least a few observers of international sport as a rebellious or “edgy” endeavour." 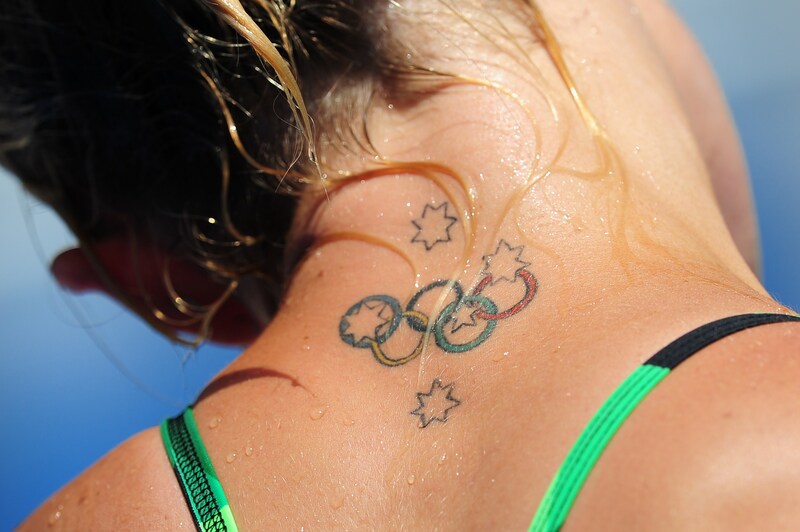 So although there doesn't seem to be a rule that Olympians weren't allowed to have tattoos, Smith's Maple Leaf tattoo was very unusual. Koch and Brown explained, "In essence, the act of tattooing problematizes the real athletes’ body with the pristine and disciplined “ideal” body of Olympic athletics. In this sense, Smith’s act was both explicitly and implicitly transformational." Koch and Brown further discussed how Smith's ink inspired other Olympic athletes who got tattoos. So it seems there was never a rule in place that disallowed Olympians from sporting tattoos, but there are definitely strict guidelines in place informing participants what designs they are allowed to visibly wear nowadays. It appears the number of tattooed athletes has grown since the '70s, ever since Smith rocked his rad Maple Leaf ink – which is great news for athletes who want to express themselves creatively!